Love your current phone but wish it cost a little less every month? Straight Talk can help. We have a simple, three-step process for bringing your own phone that can help you save around $45 a month, all while keeping your current number and network. The process can seem daunting, but if you follow these steps, you’ll be on your way. Click here and follow the instructions to check compatibility. You’ll be asked to provide your IMEI, MEID or ESM number (we’ll show you how to find it) and where the phone will be used. You can shop quickly here. Our $45 Unlimited* plan offers up to 8x more high speed data than other no contract $45 plans and saves your around $45/month. Note: Don’t let GSM vs. CDMA scare you. Technically, these acronyms denote how data is converted into the radio waves that your cell phone sends/receives. 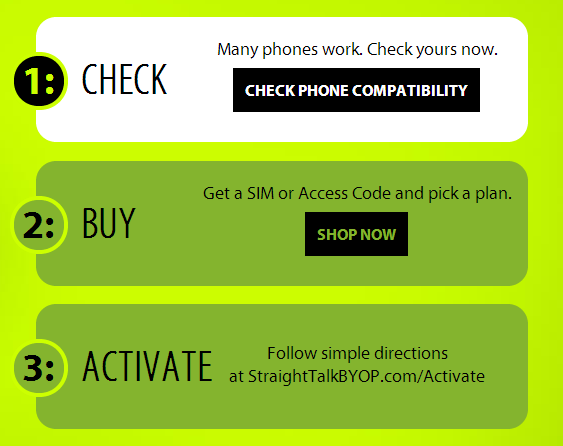 Different carriers use different technologies, so the difference between you using an Access Code or SIM card in our BYOP program basically depends on your carrier. See how to activate your device hereand feel the freedom. We hope we outlined our Bring Your Own Phone (BYOP) as clearly as possible. Please ask us any questions in the comments, and enjoy saving up to $950 per year! *30 day Unlimited Plans include 2.5 GB of high speed data per 30 day cycle. After 2.5 GB, your data speed will be reduced for the remainder of the 30 day cycle. High speed data is restored once a new 30 day service plan is redeemed at the end of the 30 day plan cycle. Other limitations, terms and conditions of service apply. Straight Talk reserves the right to terminate your service for unauthorized or abnormal usage. Please refer always to the latest Terms and Conditions of service.